In Praise of the Amaryllis. (Or: What makes a British Flower British?). And so it is with British flowers. When I began my blog and wrote my "About" page for Honeysuckle and Hilda I was very focussed on the importance of using only British, seasonal flowers. And I still am. Absolutely committed. But, goodness me, it can be difficult at times, and already I have fallen off the wagon once or twice. A quick glance at the photograph at the top of this post reveals some delicate mini protea floating around my 1950s Beswick vase. I didn't intend to buy them, I was chatting to Azar in The Blue Lavender one day and they just caught my eye. "But they're not British" I whined "I can't...". She pointed out that I wouldn't have chosen the South African imported flowers if I had gone to the wholesaler, but as I was in her shop, and she had made the decision to buy them in, really it didn't count. I succumbed almost immediately. It was a rare blip, but it made me think more carefully about my formerly smug use of #britishflowers. Which brings me to the Amaryllis. Depending on your sources, the Amaryllis originates in either South Africa (Wikipedia) or Brazil, as discussed in an article by Sarah Raven in The Telegraph a few years back. Either way, it does not trace its origins back to the UK. But, these days, Amaryllises are most definitely grown in the UK. So, do they earn a #britishflowers or not? Or are they merely #grownnotflown? A few weeks ago, I posted an arrangement of the last of the British roses, along with echinacea, rosehips, dahlias, Queen Anne's Lace and locally foraged foliage. #britishflowers and #grownnotflown both proudly accompanied this post. Underneath a dear friend, with whom I regularly discuss politics, Brexit and the US Election had written underneath #Britishflowersforbritishpeople #Notofloralimmigrants. I found it very funny, but quickly added a note underneath in case anyone reading it who didn't know me, made the mistake of thinking I was in favour of building walls or any such nonsense. In doing so, my gut reaction in fact answered my own question "this is to do with avoiding pollution and of course avoiding the equivalent of flower sweat shops abroad". And so, for me, the Amaryllis, wherever it may in fact have originated, is, for me, as long as it has been grown here, as British as The Royal Family or a Friday night curry. Which is just as well, really, as recently I have discovered a real love for these flowers. It wasn't love at first sight. Not by a long way. Rather like my husband's view of me when we first met (it took him eight dates to make a pass at me and a further four years to propose), I wasn't at all sure to start with. I tended to put them in the same category as Poinsettia and supermarket flowers and didn't have that much time for them. It was only two years ago, on a Christmas workshop with the arbiter elegantarium of flowers, Miss Pickering, that I even tried putting them in an arrangement, and then only because she handed them to me and I didn't dare not to. She told me to cut them short and put them at the outside edges of my vase. I did as I was told and they looked wonderful. 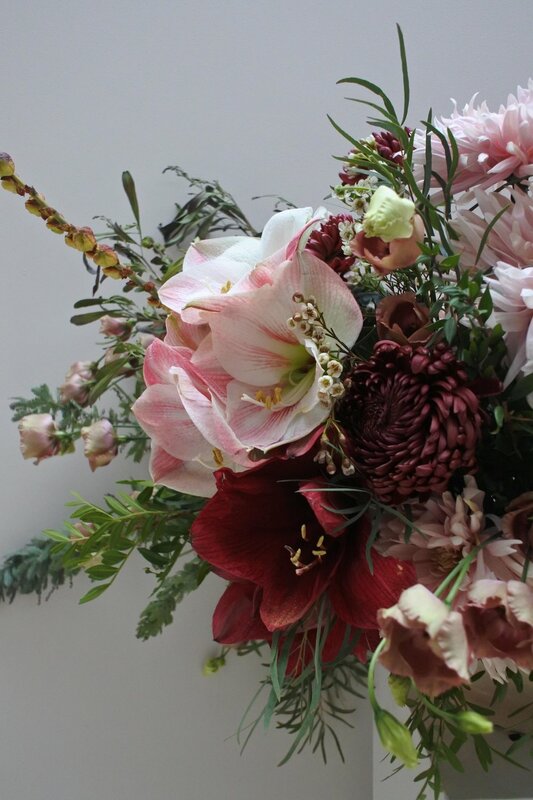 Last year, I came across what has become my favourite online image of a winter arrangement on The Blue Carrot's website - a mixture of pines, hips and amaryllis - I love it as least as much as any high summer extravaganza of peonies, foxgloves and roses, quite possibly more. Then I sort of forgot about them until a month or two ago when I bought some bright red ones for a specific piece. And then I spotted some amazing striped ones in Daylesford on our anniversary (I bought two, I didn't feel I could afford three at that price, but I still regret my stinginess). And every week since then, I have been incorporating them into whatever I do. They are such big, impressive blooms. As such, they give me an excuse to "go large" in everything I do. And now I don't know what I ever did without them -in floral terms at least. And people have been making kind remarks about my Amaryllis based posts. One florist confessed that she too had some lined up for an event, (beautiful, soft "Mocha" ones) and checked in to see how long it takes for them to open fully. I even heard from someone who is growing them but until then hadn't decided how to use them. A picture editor got in touch as she planned to use them for some publicity shots and wanted to know where mine had come from. And so, as a conversation starter, these big, bold flowers have quickly become my favourite British flower for this time of year. The fact that they facilitate my propensity to err on the large scale side of flower construction only adds to their appeal. I think I might even introduce a new hashtag #rockmeamaryllis to see if I can drum up some support for this most worthy of species. Because what Instagram definitely needs right now is more hashtags! When I began this post, I wasn't sure what it was I really wanted to say, except "I really, really like Amaryllises". It has sort of evolved into musings on the difficulties on sticking rigidly to one's principles, with the briefest of allusions to recent political events around the world that have left me feeling very sad, and a plea for one genus whose reputation has perhaps faltered in the fickle world of floral fashion. And not for the first time, I found myself with rather more to say than I realised. Thank you for listening.